With Baby L's arrival right around the corner, my sister and brother-in-law planned and hosted a lovely baby shower for our friends and family. Using the colors of our nursery - blush, navy and hints of gold - each detail was perfect. As we started to plan for the baby shower, I had three main requests. 2. Male spouses and significant others should be encouraged to attend. 3. Easy on the traditional baby shower staples. 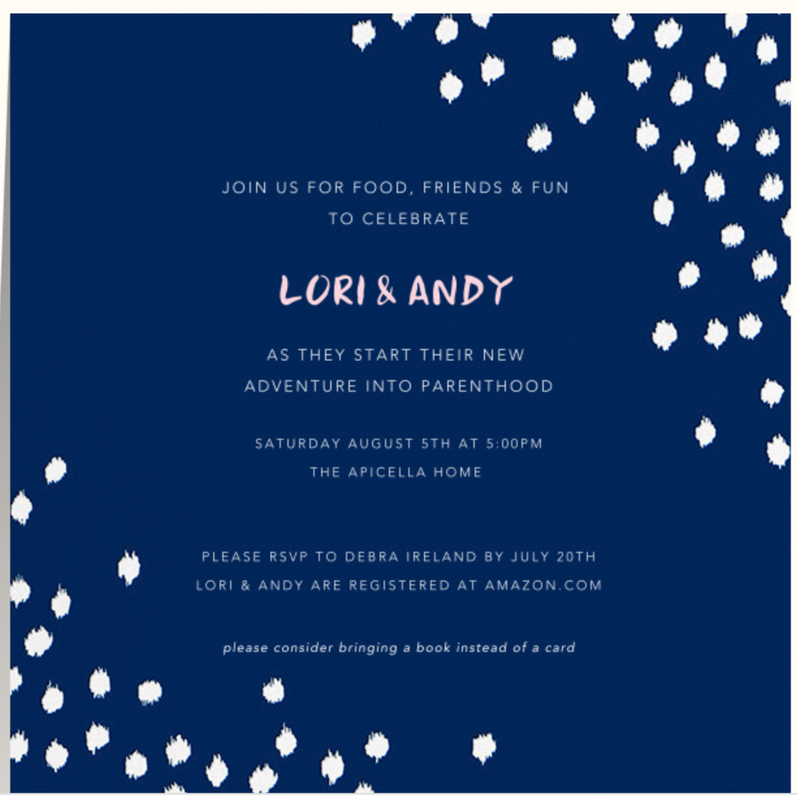 I really wanted a classy, non-traditional, co-ed party that was more about celebrating our baby girl with friends and family. And my sister and brother-in-law delivered! Now, there's something you should know about these two. My sister, Debra is not a planner. Her husband, Domino is a MAJOR planner. He has a long-standing career in event coordinating and developing recreational programs. They were also planning remotely, as they live in Raleigh, NC. Debra really didn't want me to have to do any of the wok for the baby shower, even though it would be hosted in my Gainesville home. It was definitely hard to turn off my Type A planner brain and become the guest of honor! The first thing we had to tackle were the invitations. Hours of scouring Pinterest for ideas left us disappointed. 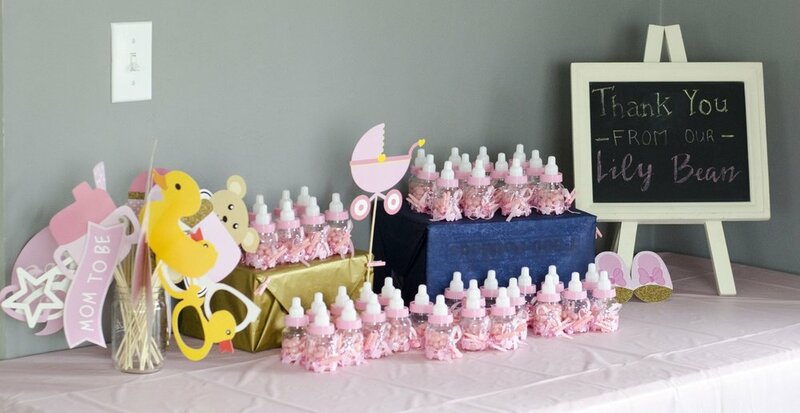 Every baby shower option was bright pink with a cheesy image of a rattle or baby carriage. Not exactly the classy, non-traditional look I was going for. Just like wedding invitations, this piece would set the stage for the event. I was also very aware that the invitation would be the first indication for male spouses and significant others to either feel comfortable attending... or to be totally turned off. Considering that many of my husband's friends are firefighters and paramedics, I knew we needed something that didn't scream "goo-goo ga-ga."
Every baby shower I've been involved in has some kind of activity. From the clothespin game where you can't say the word "baby" or the chocolate bar poopy diaper game. I really didn't want any of these traditional activities. Forcing our friends to stick their face in a diaper is not my idea of fun. I wanted guests to have the opportunity to do something fun and creative without feeling pressured to participate. We settled on two activities: Guess the Birthdate and Wardrobe Design. For this activity, guests could guess when Baby L would make her arrival. I used a dry erase calendar that typically marks our important dates to remember. Using sticky note tabs, guests wrote their name, birthdate guess (and time if multiple people chose the same date), and placed it onto the calendar. The winner would receive a fun prize! All of my friends know how much I enjoy my wardrobe. In a previous home, I transformed a bedroom into a closet. There was a wall of shoes - it was epic! So it was only natural for my daughter to start out her life loving her wardrobe. Combining my love of clothes and crafts, Debra had a great idea to have guests design a onesie, bib or leggings for Baby L. She ordered plain white pieces in varying sizes, fabric markers and stencils. Placing cardboard inside the garment helped to prevent color bleeding. We hung a clothesline above the wardrobe station to allow guests to hang their works of clothing art when they were done. After the shower was over, I loved sorting through each piece and guessing who was the designer. Keeping with our blush, navy and gold color scheme, we selected decorations and crafted some of our own. It was important to me to keep decorations classy (remember, one of my 3 requests was easy on the baby shower staples). 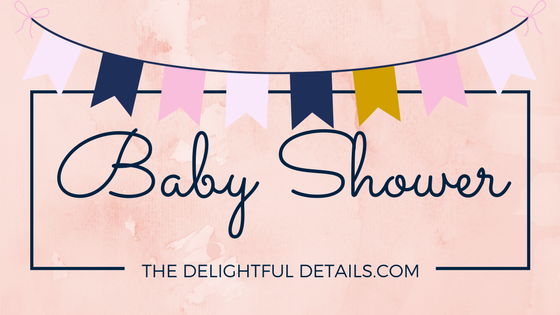 I chose to create a tassel garland that could be repurposed as decorations in Baby L's nursery after the shower. A more detailed DIY post to come on creating this beautiful tassel garland! Of course, no party is complete without sending guests away with a little gift to remember the day. My husband and I had started calling Baby L our "little bean" during my pregnancy. We thought it would be clever to give our guests jelly beans. Domino found little pink bottles to hold the jelly beans, and Debra created a chalkboard sign. It was such a great day spent with our family and friends to celebrate our little bundle of joy and the new adventure we were preparing for. I enjoyed being the guest of honor instead of the planner for this joyous moment in my life. Thank you Debra and Domino for putting together so many little delightful details!